Rates are quoted in Euro, per person, net non-commissionable. Packages are per person, cannot be shared with other players and are non-refundable. Juniors up to 15.99 years are granted 50% discount on above mentioned rates. To play on the Championship Course a handicap of 36 is required. Proof of handicap is required prior to play. Guests with higher handicap are invited to play on the Executive Course. Requests for t-time/s reservations should be made in advance by E-Mail or telefax. Tee-time/s will be confirmed according to availability. For groups of 6 paying golfers and more, full payment of the reserved service/s is to be settled by bank transfer two weeks prior first day of play. Invoices are payable in USD. Copy of the bank transfer including swift is to be sent to Madinat Makadi Golf Resort. For group bookings of minimum 10 players, to be arranged with golf course management. 25% cancellation fees will be charged in case cancellation is received from 14 to 8 days prior to the reserved first tee-time. 50% cancellation fees will be charged in case cancellation is received from 7 to 3 days prior to the reserved first tee-time. 100% cancellation fees will be charged in case cancellation is received 2 days prior to the reserved first tee- time or in case of no show. 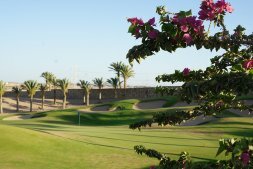 Madinat Makadi Golf Resort and it’s facilities are open 365 days a year from 7:00 am until sun set. Guests should reserve and confirm t-times in advance. Daily playing operation is in flights of four players. Players are to respect the international golf-etiquette and the local rules and regulations. If etiquette, local rules and regulations are flouted players can be banned from the golf course. Suitable dress code is required on the golf course. House animals are not accepted on the golf course and in the Clubhouse. Mobile telephones should not be used on the golf course. In case of regional, national or international required tournaments or events, Madinat Makadi Golf Resort has the right to change the reserved and confirmed ttimes as long as the guests are informed two months in advance. Any featuring of Madinat Makadi Golf Resort in any kind of publication is to be approved first by Madinat Makadi Golf Resort.